YogaFit's Level 4 teaches an advanced physical practice and teaching skills. 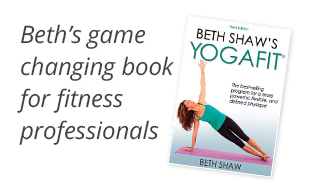 It also delves into Patanjali’s Yoga Sutras, which teaches you the philosophy of yoga and the essence of YogaFit®. Flowing from pose to pose, which teaches us how to flow through the ups and downs of life and to pause, breathe, and find balance and centeredness in a pose whenever we need to. Common Sanskrit translations and Sanskrit terms.